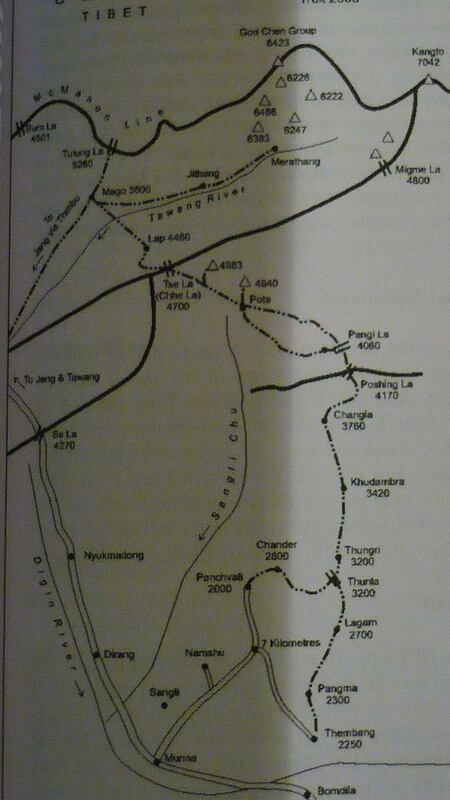 For most of it's part, this trek follow so called Bailey trail, used by colonel Bailey in 1913 and by invading Chinese in 1962 as well. More about trekking in Tawang district can be found in this good book of Harish Kapadia. From Tse La pass, instead of following good path west to Mago, we continued north, with no path, to go directlly to the lake under Gorichen mountain. This was probably the most beautiful part of the trek. 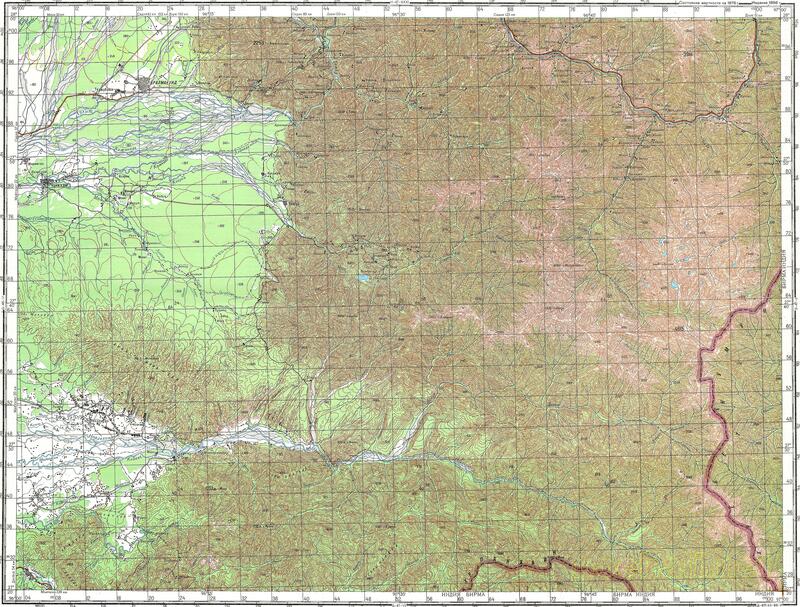 More can be seen in the Russian military map, full size here. It took 9 days of gentle trekking. This is an intresting option to approach Gorichen mountain, still not climbed by foreigners probably, in order to avoid Indian military at Mago village. Although they were ok with our general Arunachal permit when we came from Gorichen and headed out to Tawang, they would probably not be ok when coming to Gorichen. Especially with the aim of climbing it (better no say this to them, but this is a problem if you are with porters). 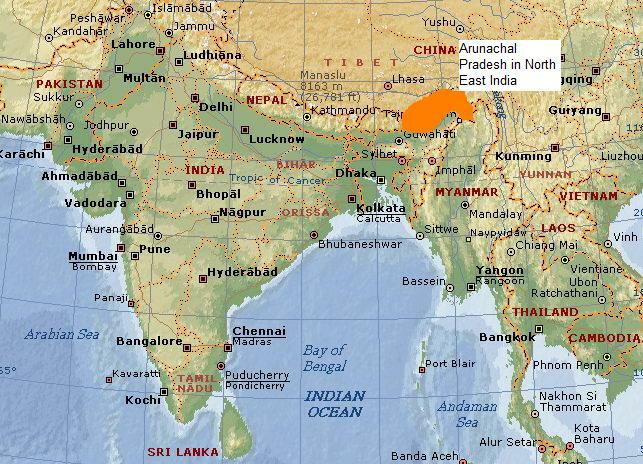 It lies directly on the border with China and this border is off limits to foreigners oficially. 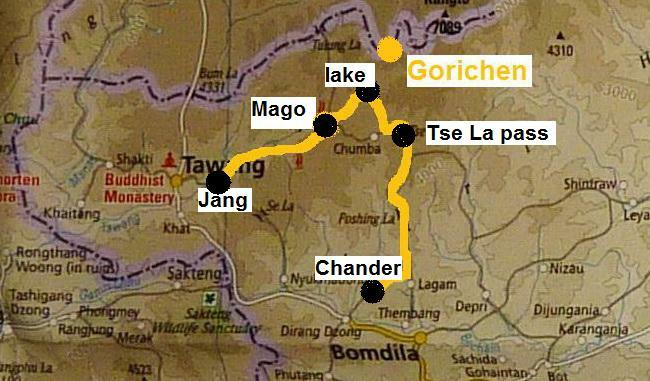 Without stops, if would take about 5 days to reach basecamp of Gorichen from Chander/Larjab (out way). It's not bad compared with 3 days from Jang (clasical way) and there are no army posts on the way. Plus the way from Jang to Mago is quite boring in the canyon and dense forest, especially when going this twice. You can see from this plan from Harish Kapadia book, that the road up to Chander (and eventually Larjab) starts from a place called Munna. 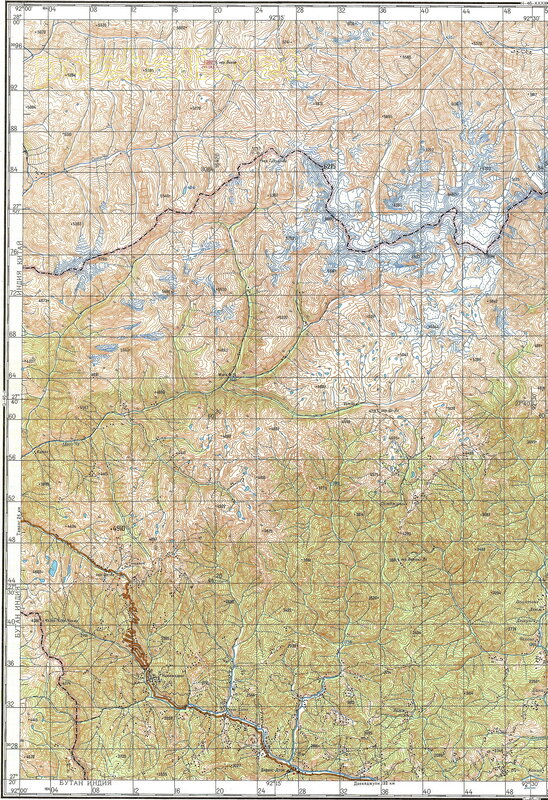 But the final part under Gorichen is incorrent on this plan - 1 valley is missing, the Russian map is correct. You can see Kangto seventhousander here as well. Unfortunatelly, it's not visible from Tse La pass of from under Gorichen mountain. I wonder why anyone did not attempt to climb Kangto from Gorichen side. This is probably the best access path over dense forest / jungle. This road map was painded next to the road. 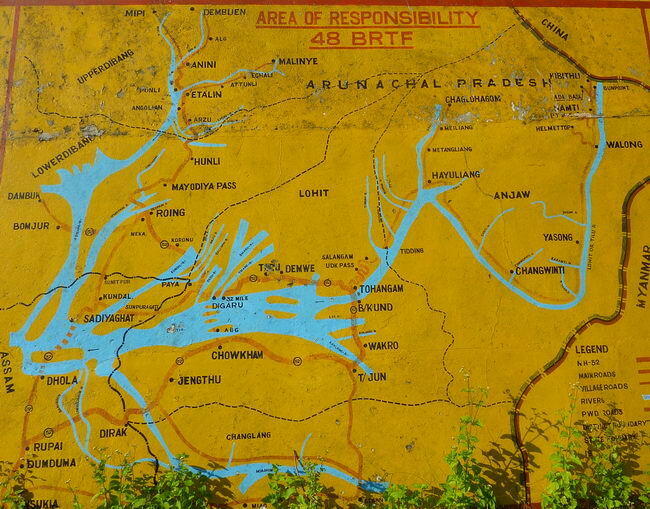 Although no being complete map of roads in eastern Arunachal, it shows correctly (in contrast to ReiseKnowHow map) the area around Wakro and the way to Anini. This is a beautiful jungle trek for about 3 days (2 days up, 1 day down). In order to visit higher places of northern Namdapha national park (or Kamlang Wildlife Sanctuary) it would be better start from Hawain, capital of new Anjaw district (up to 200? it was all Lohit district). Hopefully a path is still passable from there to Wakro. It used to be used before road following Lohit river was build. 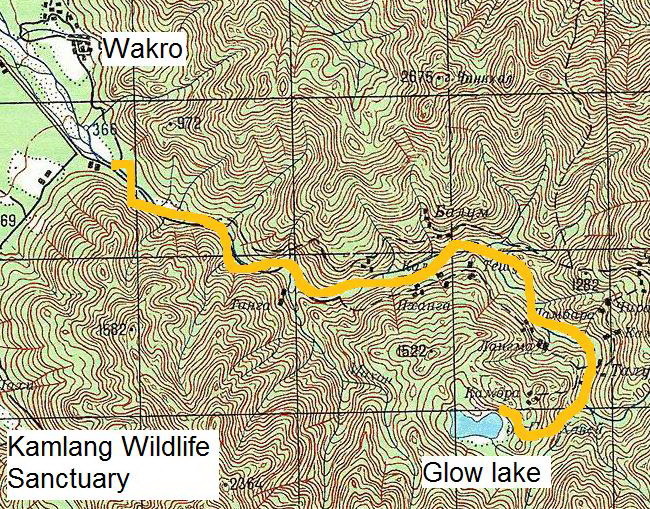 If the path is not passable, it would still be shorter to return do Hawai probably (as the 3500m pass is closer to Hawai then to Wakro). Original Russian military map (where that path is visible) is here.